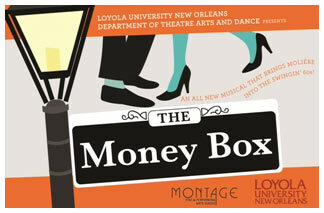 Celebrated playwright and New Orleans native Ricky Graham will present the world premiere of his musical, “The Money Box,” at Loyola University New Orleans beginning tonight. The production features music by Loyola alumnus Jefferson Turner ’99 and lyrics by Graham and co-writer Sean Patterson. Presented by the Department of Theatre Arts and Dance, this exciting adaptation of Moliere’s “The Miser” will run in Marquette Theater March 8, 9, 14, 15 and 16 at 8 p.m., March 10 at 6 p.m. and March 17 at 2 p.m.
For more information, contact C. Patrick Gendusa in the Department of Theatre Arts and Dance at 504-865-2835 or Jess Brown in Loyola’s Office of Public Affairs at 504-861-5882.